Are You Throwing Away Sensitive Data? 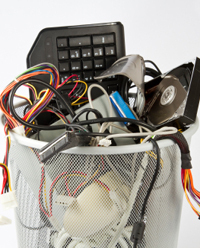 New technology makes it harder to completely sanitize discarded IT equipment. Keeping the information contained in the company’s IT equipment secure is an obvious priority. But as technology becomes outdated and is recycled, replaced or repurposed, keeping the data secure is still a vital part of the process.